I have a membership at the museum and often make my way down there on weekday mornings when I don’t have to be at the office. I spend an hour or so shooting the butterflies. I’ve found that they’re calmer in the morning hours when it’s cooler and the children haven’t arrived to disrupt them. It’s easier to photograph them peacefully resting on leaves than chasing them all afternoon in the humid exhibit. As far as the technical composition goes, I currently use a Canon 40D, but this photo was taken with my older Canon XT which goes to show that you don’t have to have a $5000 camera to take nice macros. My lens is the Canon 60mm f/2.8 using manual focus and has a Sigma Macro Flash which allows me to achieve even lighting across the subject and grants me the freedom to shoot with a deeper depth of field. This one was an f/13, which is why almost the entire shot is in focus. Sometimes I use extension tubes which makes me look like a CSI photographer, but you just can’t beat them for letting you work up close. I would like to share one thing about photographing butterflies that I’ve learned the hard way, but this applies to pretty much all insects (especially dragonflies). You may think you’re being all slick by crouching down and slowly sneaking up on them and then wonder why they flutter away at the last second. Well, the answer is simple, you’re hunting them and they know it. I’ve found it’s easier to just walk on up to them and point the camera or find a spot that they like to perch and get there before they do. That’s not predator behavior and usually it won’t spook them. Wow. 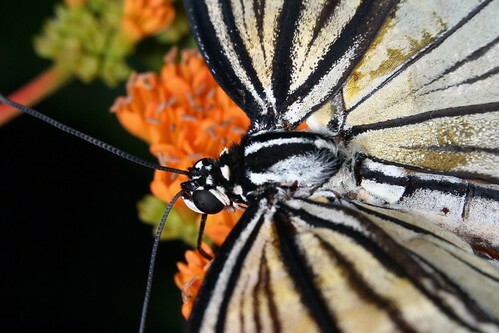 emmiegrn’s shot of one of our Rice Paper Butterflies is amazingly close. We hope this and all the other amazing photography in our group on Flickr will inspire you to bring a camera along next time you’re here – and show us what you see. That’s an amazing picture! What I would do for a camera like that!! Next Post Eight is Enough?